Welcome back to this week’s Fashion Lesson. Today, I am going to cover the highs and lows of the waistline. No, not the circumference. I am talking about the High waist and Low waist gals out there. First, you need to determine which category you fall into. If you look at the figure below, you will see three different figures divided into four segments. To begin our study, first look at the segment that breaks at the underarm to the break of the leg. 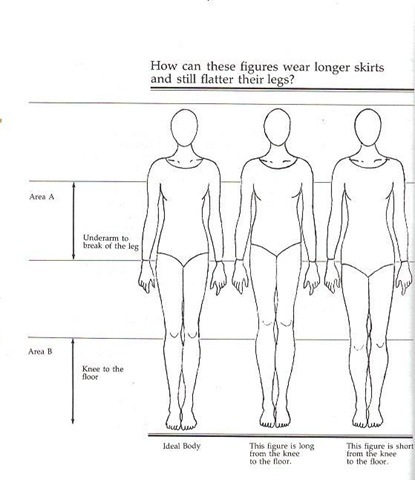 When looking at the illustrations from left to right, you may see if you have a balanced proportion, short waist or a long waist. A balanced proportion has four equal segments. In the short waist illustration, you can see that the break of the leg is higher than that of the proportionate figure and the kneecaps are well above the proportion line. In the third illustration, you see that this woman has a longer torso and her kneecaps are a shorter distance to the floor. Once you know what category you fit in, we can start working our magic. First I will provide the Do’s and Don’ts for the high waist or short torso woman. Do look for jeans that hit just below your belly button or lower. This of course depends on if you are dealing with a “muffin top”, so plan accordingly. If you have a little extra weight, do not opt for the low-low rise. Do wear a jacket or shirt that hits at your hip or a little lower. You can sometimes get away with a shorter jacket, but it is very important that you wear a longer shirt underneath that hits below the hip. This will even out that segment’s proportion. You are one of the few who can get away with a skirt that hits just above the calves or is long. Because your legs are so long, this length will not “stump” your legs. Lucky you, you can wear this seasons long sundresses! When looking for shorts this summer, do consider some of the cute Bermuda or long walking shorts. Don’t wear a short mini skirt or hot pants without a little help from a longer shirt or jacket. With legs so long, short shorts or mini skirts tend to look even shorter. If you pair it with a longer top at the very least, it will help balance out your proportion. Don’t wear high waist pants. I had a terrible time during the 80’s because all you could find were high waist pants and cropped or shorter length tops. Not a very good look. Don’t wear thick belts. You do not have much area to work with, so keep it to a thin belt at your natural waist to add some definition. Click on the image below for shopping information. Now it is the long waist or long torso woman. Do wear a shorter jacket or an empire waistline top to lengthen your torso. When considering tops, I wouldn’t go any lower than your waist line. This will add length to your legs. Do wear a slightly higher rise pair of jeans. You could get away with the high waist skirt or jeans that were so popular last Fall. Unlike the short waist ladies, you can wear a thick belt because you have more space to work with. There are so many to choose from, so have fun! Do think about wearing a shorter hemline on your skirts or shorts. Again, this will add length to the leg and add proportion. Do consider a pair of high heels as your friend. When wearing flats, opt for a pointier toe to lengthen your legs. Don’t wear low rise jeans. As mentioned with the above do, a higher waist will give you proportion. Don’t wear chunky heeled shoes. It will make your legs look bigger. Opt instead for something with a skinny heel and without an ankle strap. Don’t wear those really long shirts with leggings. Sorry guys, this is a double don’t. A long shirt will cut off your legs on any given day, but paired with legging that usually rest above your ankle, will just cut off your legs even more. Which brings me to our last don’t. Don’t wear cropped pants. What about hourglass plus short waisted? Closet Therapist, sorry for the delay in responding to your question. First, I would like to thank you for the visit to this blog. I should have mentioned that in this piece as a woman with a short waist can use all the extra space possible and if your bust is hanging lower than it should, it will interfere with this area. You also bring up a very good point. Most of us are a combination of proportions. To understand how to dress your figure, consulting several of my Fashion Lessons and using a combination of tips to flatter your figure may be helpful. To get a better idea of how to dress a hourglass shape, consult Fashion Lesson #5 Hourglass Shape for further information.